A History of Serving the Independant Retailer and Small Business. Over 25 years ago, in a garage on the north side of Chicago, two friends had an idea that grew into a successful business called Specialty Store Services. Today we continue as a second generation family business proudly serving independent and family-run businesses throughout the U.S. and beyond. 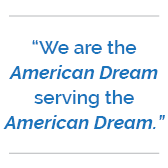 The words of our fathers ring as true today as when they said them many years ago, ï¿½We are the American Dream serving the American Dream.ï¿½ We are dedicated to providing you with the best service and products to help make your dreams come true. We are committed to providing you with quality products at competitive prices along with our 100% Satisfaction Guarantee. Our new catalog is a showcase of innovative retail merchandising solutions to help grow your business.